Scribblenauts Unlimited developer 5th Cell has announced that it is working on a new game, Anchors in the Drift, a free-to-play action-RPG in which the Earth is invaded by an inter-dimensional empire known as The Domain. That, predictably, leads to bad times for us, as islands of different civilizations called Remnants end up spread across a quantum ocean (yes, "quantum ocean") known as The Drift, while heroes from throughout history—the Anchors—seek to liberate them from the Domain's control. Still following? It does seem like a convoluted setup, although the action in the crowdfunding pitch trailer looks fairly straightforward. The hook here is that players can customize their abilities with collectible cards, called Arc Mods, that are earned during gameplay. Each card has a cost, cooldown, category, and rarity, and they all work together seamlessly. The only limiting factor is the total "Arc Cost," which tops out at 100. The game itself is divided into two modes, Recon and Warfront, which take place on two "opposing oceans" represented on a 2D map. The first mode, Recon, allows players to scout and accept challenges at their own pace, to earn rewards and increase their abilities so they're better prepared to take part in the second mode, Warfront. That's where the real action is taking place: Warfront offers a series of increasingly difficult Remnants (those islands in the Drift, remember) in a ladder format, with progress tracked on seasonal leaderboards. 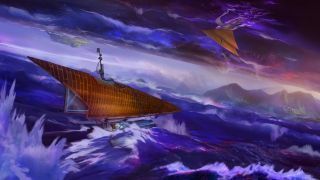 5th Cell is seeking $500,000 in funding for Anchors in the Drift on Fig, the games-only crowdfunding platform that launched earlier this year. It's raised $95,000 so far, although only $4000 of that has come by way of conventional crowdfunding pledges. Investments make up the balance; you can find more about that here, although investing as opposed to backing remains restricted to accredited investors. There's no mention of a release date on the Fig page, but the "estimated delivery" date for backer rewards is the summer of 2016.